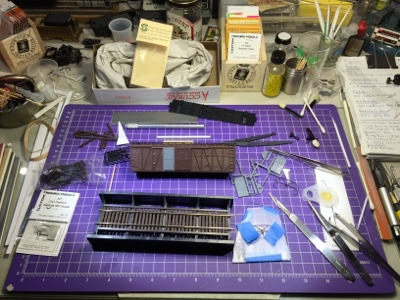 Working on the GTW/CN 1-1/2 door boxcar I started at Don Valentine's Hands-On clinic at the NERPM last weekend. And the decals from Black Cat Publishing arrived in today's mail! Finished the MicroEngineering bridge for the Mattabassett River on the East Berlin branch. Just needs paint and weathering. And, taped to a small piece of glass in the lower right corner there, is my first attempt at attaching a die-cast metal MU connector/plug part to a Delrin end railing. 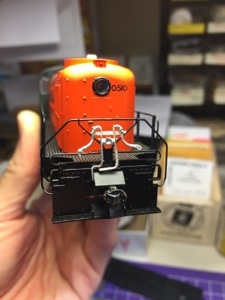 Just starting to "New Havenze" my Proto1000 RS-2. . . So, what's on YOUR workbench? Who makes the MU hose part for the RS-2?